Tate-Yudasin revisited in Chess Life! Emory Tate is famous for his attacking style of play and in 1997 produced one of the most spectacular attacking games in recent history. That game was played against Leonid Yudasin at the U.S. Masters tournament in Chicago and has since become the subject of intense analysis. The game was awarded the "Best Game" prize and demonstrated the unique tactical ability of Emory Tate. Jon Jacobs has penned an article in December 2006 Chess Life called, "The Sense of Danger, Part III: Nature, Red in Tooth and Claw." 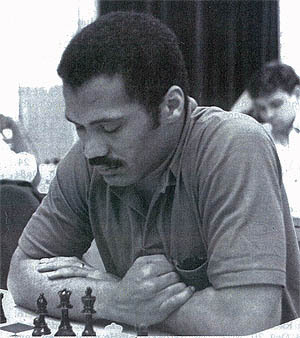 In this article, Jacobs examines Tate-Yudasin and parts company with Jack Peters' version done in the July 1997 Chess Life. Jacobs' article theme recounts several metaphors for explaining chess battles. According to Jacobs, Tate took issue with the quality of Peters' annotations and made several corrections. In addition, chess engines serve as a tool for checking tactical accuracy… although Tate's analysis appears to be quite sound. at the 1998 New York Open. Accompanying the article was a historic picture of Tate (shown above) in solemn thought at the 1998 New Open. One may notice that Tate rarely sits back in his chair… sitting forward on his haunches ready to pounce on his prey. This game shows how Tate rightfully earned his reputation as one of the world's most creative attackers. See article and revisit this historic game!